If you receive a damaged package, please have the driver make note of the damage. Please contact K&M immediately to file a damage claim. K&M Manufacturing is responsible for filing damage claims with the carrier. If damage by carrier or concealed damage is detected, please call K&M Manufacturing immediately to report and start a claim. Please retain any cartons, packages or related data until inspection has been made by the carrier. K&M Manufacturing is responsible for filing damage claims with the carrier. K&M Manufacturing will notify you as to the disposition of the damaged merchandise. Whenever possible, please reuse the original shipping and package materials from the product you received. All returns require preauthorization and must be accompanied by a Return Merchandise (RMA) form. RMA forms can be obtained by contacting a K&M sales representative at 800.328.1752. Product must be returned within 30 days from the date of invoice for a full refund or credit. RMA form must be included in your return package. Merchandise returned without an RMA included will be subject to a 15% restock fee or no credit. Product must be new condition, except in the case where merchandise is defective or damaged in shipment. Credit will be issued based on inspection of the returned merchandise. Product determined not to be in new condition will be assessed an additional fee based on the merchandise condition. If you purchased a product from a dealer, returns must be processed through the dealer. If you purchased directly from K&M, contact us at 800.328.1752 to begin the return process. The customer assumes liability for freight when returning merchandise ordered in error. Returned merchandise must be shipped with all transportation charges prepaid. Merchandise returned C.O.D will be refused. K&M Manufacturing will issue call tags for defective merchandise or merchandise shipped in error. What are your restocking fees? All special orders are non-cancelable, non-returnable. 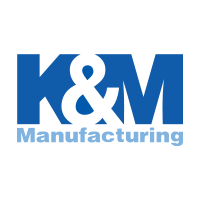 All K&M Manufacturing products carry a 1-year warranty against defects and flaws in workmanship. Some exclusions apply. Product replaced at no cost, FOB Renville. If you purchased a product from a dealer, return the defective merchandise to them. If you purchased directly from K&M, contact us at 800.328.1752 to begin the return process. In some circumstances, warranty is longer than 1-year. Warranty for specified items will follow the manufacturer/supplier’s warranties for workmanship and material.